Apocalyptic filigree and bravura filmmaking aside, The Revenant keeps coming back to an old, bloody story: good man chases bad man for doing bad things to good man. A spiritual view of the natural world clashes with the animalistic drives of a fallen humanity in Alejandro Gonzalez Inarritu’s operatic wilderness survival tale, The Revenant. This freewheeling adaptation of Michael Punke’s novel about fur trappers, Indians, and soldiers tangling in primal ways on the Western American frontier in the 1820s stretches the limits of endurance in more ways than one. Inarritu’s film pushes against known boundaries of art, suffering, and revenge tale. The seeker of vengeance here is Hugh Glass (Leonardo DiCaprio), a white frontiersman stuck between two worlds. For scholars of the Old West, the real-life Glass is an already totemic figure whose daring exploits as a fur trapper along the war-torn Missouri River were legendary and already accreted with fantastical exaggeration during his lifetime. Having lived with a tribe for some time, Glass had an Indian wife and starts the film with an Indian son, Hawk (Forrest Goodluck). This leaves him suspect in the eyes of his fellow trappers, particularly John Fitzgerald (Tom Hardy), who doesn’t bother hiding his contempt for “tree n-----s”. The divergence between Glass’ stoic nature and Fitzgerald’s venal sleaze is starkly drawn right from the start. If only it was enough to string along an entire film. 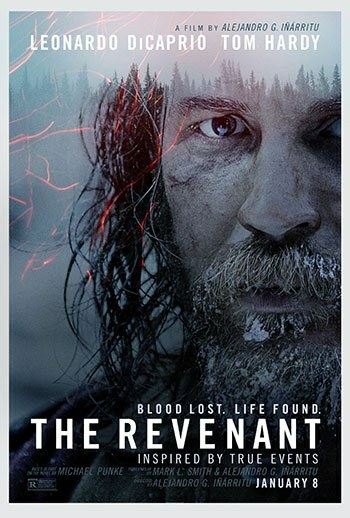 After a gut-wrenching Indian raid on the hunters’ camp -- captured with alternatingly quiet and fiery poetry by Inarritu’s usual cinematographer Emmanuel Lubezki -- a few survivors strike out into the wilderness with their leader Andrew Harry (Domhnall Gleeson). An atmosphere of doom prevails, helped along by Glass’ flashbacks to a raid by soldiers (either American or French, as both appear to be operating in this contested wilderness) on his old Indian village left his wife dead and him barely half-alive. Glass’ situation becomes increasingly dire after getting stuck between a mother grizzly bear and her cubs. The brutal mauling that follows, with a screaming Glass flung about like a mouse being toyed with by a cat, is all shot in a single take -- an Inarritu trademark that is viscerally effective each time it’s used here -- ends with him as little more than a bloodied rag doll. Harry orders Fitzgerald and young trapper Jim Bridger (Will Poulter) to stay behind with Glass until he can send help. Given that Bridger is about as green as they come and Fitzgerald plainly means to abandon Glass, it seems an unconscionably bad decision by the commander. That is confirmed once Fitzgerald not only leaves Glass to the wintry wild, but also convinces a morally uncertain Bridger with a devil’s logic that their charge was doomed, anyway. It’s an even worse problem for the script, which Inarritu worked on with Mark L. Smith, who’s done mostly horror films, like Vacancy. Given that Glass begins the film haunted by visions of a dead wife who seems to be enticing him to join her, pushing him toward his own grave doesn’t provide the greatest dramatic jolt. This is an issue that becomes more acute as the film spins on, gorgeously but sometimes vacantly. That’s not to say that Inarritu doesn’t stack the deck with sound and vision. As maybe our foremost cinematic poet of battle and chaos, he keeps embedding the viewer right inside the whirlwind. Every scene shimmers with a harsh beauty, even when displaying atrocity. The camera is eager as it is also serene, capturing moments of startling violence (arrows through necks, gurgling wounds, blood spatter on the lens) with the same equanimity that it does a rushing river. The film trawls through the forests and seeks out the entrancing skies and vistas of this wilderness with the same restless investigation that Lubezki brought to Terence Malick’s The New World, to which this film feels related, like a distant cousin on the Tarantino side. Both those influences push the film towards catharsis, whether by inner revelation or violent action. Fitting its title, The Revenant is powered along by a lengthy series of resurrections, wherein Glass hauls his devastated body out of one womb- or grave-like space after another, his every sinew taut and determined. Glass keeps striking out across the blindingly gorgeous snowy landscape, a nearly voiceless presence wrapped in fur and scar tissue. It’s the kind of thing that can pass for sheer spectacle or thinly sourced spirituality. In either case, the quasi-religious cast to many of Glass’s scenes can feel beside the point, given that Glass is only bothering to stay alive in order to exact revenge. Glass is not the only figure here who’s chasing ghosts. A dramatically moribund subplot following Bridger and Fitzgerald finds each man trapped in different ways by the guilt over what they’ve done. After so much time with the mostly mute Glass, the film feels energized when it returns to the wandering Indians who slaughtered so many of Glass’s comrades. Led by their quite possibly insane chief Elk Dog (Duane Howard), they search obsessively for the daughter stolen from him by French traders. It’s a fittingly tragic image, given that in real life the Arikara Indians (called “Ree” by the film’s trappers) were at this point in history just a few years away from being decimated by disease and the white man. Apocalyptic filigree and bravura filmmaking aside, The Revenant keeps coming back to an old, bloody story: good man chases bad man for doing bad things to good man. At some point, forgiveness would be more interesting.